Ogden outfielder Jacob Scavuzzo played four sports in high school but wasn't on anyone's radar to compete at the collegiate level. When he started to draw interest from pro baseball scouts, he knew what his next move would be. "I was drafted in the 21st round [in 2012], and I didn't really have any college offers for football or baseball," Scavuzzo said. "I was going to go to junior college and play both, but it was kind of hard to turn down the money. "Once the scouts started showing up at my house, I was pretty sure I was going to play baseball. It was the right decision for me." Scavuzzo was the 656th overall pick in the 2012 Draft by the Los Angeles Dodgers out of Villa Park High School in Orange County, Calif. He spent last season in the Arizona League refining his raw hitting skills, then spent time in the instructional league. The work has paid off for Scavuzzo this season. The 6-foot-4, 195-pounder has blended average and power, making him one of the more feared hitters in the Pioneer League. Scavuzzo is hitting .300 with 12 home runs, 38 RBIs and a .576 slugging percentage through 54 games. His home run total is tied for the most in the league with Helena's Michael Ratterree, while his slugging percentage ranks second. "I haven't really been a power guy all my life," said Scavuzzo, a right-handed hitter. "I've always had a quick bat, but ever since I got to pro ball they've been teaching me to use my legs more. Last year I was kind of gap to gap, but this year things are clicking more and more. I've hit a few balls pretty good. "I've put in a lot of work, working out with my dad. He spends a lot of time with me," he added. "And I've tried to remember the things they taught me last year in the instructional league and doing the basic mechanical stuff. I played four sports in high school, and baseball was just something I went out and did. It was very broad. But once I was able to focus on baseball and mechanics, I think I've improved a lot." Scavuzzo started this season hot and has been consistent throughout. In a seven-game stretch in mid July, he hit two homers in a game twice. To date, he has 19 multi-hit performances. With 11 games remaining in the regular season, Scavuzzo finds himself in a strong position: in the middle of the chase for the Pioneer League home run title. Scavuzzo and Ratterree are fighting Helena's Taylor Brennan, Great Falls' Jacob Morris, Grand Junction's Jordan Patterson and Idaho Falls' Daniel Rockett for the crown. Scavuzzo isn't putting too much stock into the race, though. "It'd be a great honor, but it's really not something I think about," he said. "I'm out there trying to get doubles, drive my teammates in and win ballgames. It would be a nice addition. "I'm just trying to drive the ball. It'd be a pat on the back for all the hard work." 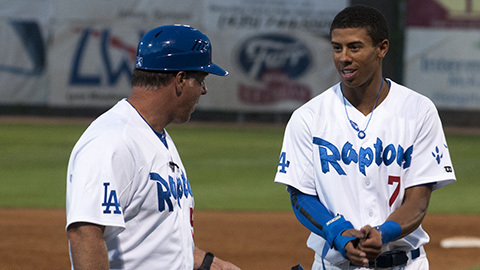 Tapia on top: Grand Junction outfielder Raimel Tapia, bolstered by a 29-game hitting streak earlier in the year, has led the league batting race for most of the season and currently sports a .358 average. Idaho Falls catcher Zane Evans has been gaining ground of late, however, lifting his mark to .352 with nine hits in his last four games. Law fought: Ogden's Adam Law pulled off a rare 5-for-5 night against Billings on Aug. 27, collecting five singles and stealing two bases in a 6-4 loss. Law, a 12th-round pick in 2013, is the son of former big leaguer Vance Law and the grandson of former Cy Young Award winner Vern Law. Washed out: Orem led Missoula, 3-2, in the fourth inning Aug. 27 when rain forced the suspension of play. The game was the final meeting on the schedule between the teams and will not be made up, becoming the first cancellation in the Pioneer League so far this season. Greg Rachac is a contributor to MiLB.com. This story was not subject to the approval of the National Association of Professional Baseball Leagues or its clubs.